The Case of the Creepy, Spooky Noise has been solved by the detectives of Standiford, Inc. (a.k.a. the homeowners). 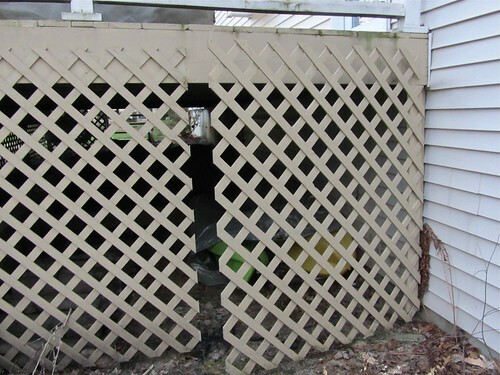 The source of the noise was the lattice door under the deck. The guilty party...we'll let you think about that for a while. For the last couple of weeks the homeowners have been hearing a weird but sporadic noise. It was hard to pinpoint where the noise came from. Upon first hearing the noise in the kitchen it sounded like it was coming from the basement. While in the basement it seemed to be coming from the main floor. Days later, while in the kitchen, it sounded like it came from upstairs. A traveling sound? What could that be? Hopefully not an unwanted visiter of the furry, four legged variety or the basilisk from Harry Potter. Sometimes the sound would come with a vibration. This was felt most in the kitchen. The next thought was perhaps it was a pipe in the wall. Besides the "traveling" of the noise, it was also very random--at times very frequent and at other times not. This evening the detectives put forth a lot of effort to track down the source. They were in the kitchen after dinner and the sound seemed to come from under the sink. They opened the doors to see if it would be louder the next time. While waiting for the noise, Detective Kelly was washing windows and stepped out on the deck to clean the outside of the door. The noise struck again. This time the vibration came directly under Kelly's feet. She sent Detective Mickey under the deck to check things out. He hesitantly went, armed with a flashlight. He looked everywhere, moving everything around. Then went to shut the door and found the noise maker. Mystery solved. Those pesky kids, one in particular (who won't be named but whose initials are MTS), left the door open or unlatched, as seen below. Here is a sample of the sound we've been listening to for the last few weeks. This is much louder than we heard it in the house, obviously. Detective Kelly is planning to use this noise to her advantage whenever a sleep over occurs. Detective Mickey will be in on the prank as well playing up the creepy noise. That is a creepy noise! I'm glad you got it solved, Sherlock.